by Gilly Macmillan is the latest British thriller told from alternating points of view about a young boy gone missing. Rachel Jenner is recently divorced and fretting her ex-husband’s new marriage when her son disappears while out in the park. Written from Rachel’s viewpoint and that of Jim Clemo, a detective on the case, the public opinion is the Rachel is a bad mother who should not have turned her back and it’s her own fault her son has disappeared. Taken through the events of the case from when Ben first can’t be found, suspicion soon turns to Rachel herself. Secrets from the past come to light. Is Ben still alive? Was he kidnapped by a stranger? Will we ever find out what happened to him? 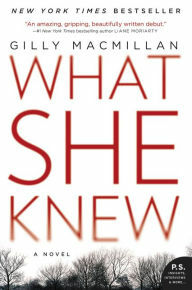 “What She Knew” is a debut novel that will keep you on the edge of your seat. I listened to the audio edition. This entry was posted on October 13, 2016 at 7:23 pm and is filed under Adult Readers Advisory. You can follow any responses to this entry through the RSS 2.0 feed. You can leave a response, or trackback from your own site.